One of the best parts of weaving chair seats is that you never work on something that is new and every chair has a unique story. 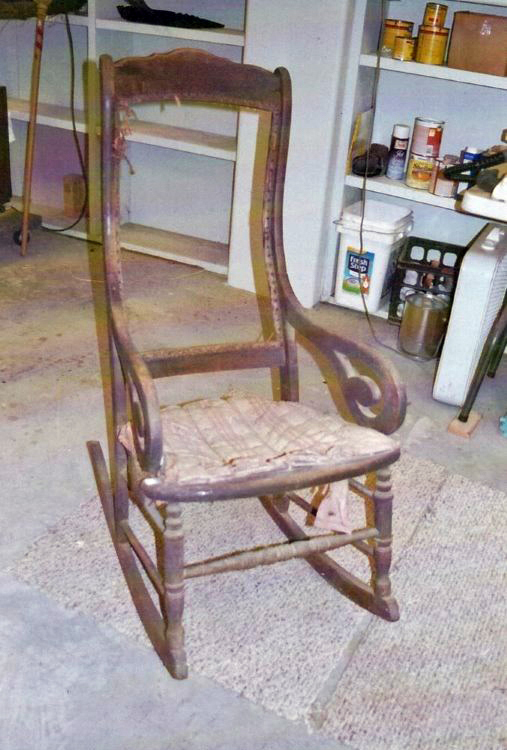 Whether it belonged to your grandmother; has been in your family for years; or was found in a thrift store, antique mall, or even beside the road on a trash pile, when you really look at the chair and listen, it has a story to tell. Sometimes there are names and dates written on the bottom of the seat or the rush weaving was stuffed with old newspapers. In the case of newspapers, carefully unfolding them to see the location of the newspaper and the date can be fascinating. 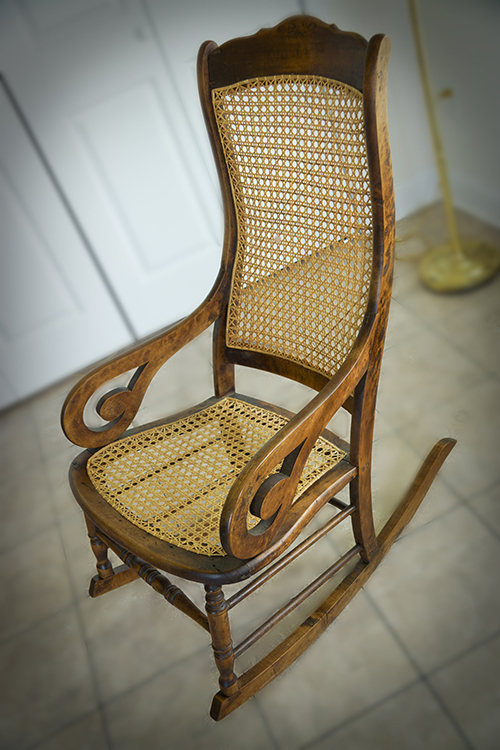 The Grecian style rocking chair in this picture was made in the United States sometime in the late 1800s. After it became old and broken, it was retired from the house and spent many years in a storage building in Osyka, MS, a small town just north of the border with LA. 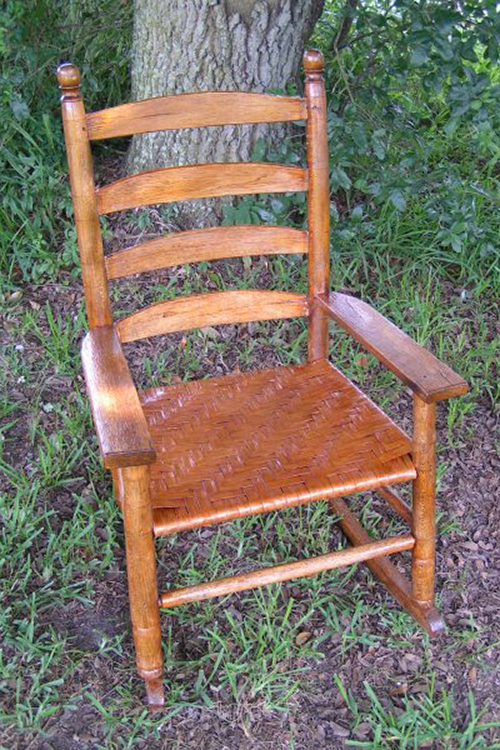 Jo got this chair, which was a cousin to the very first chair she ever caned, from an estate auctioneer, who operates the Antique Mall in Hattiesburg, MS. 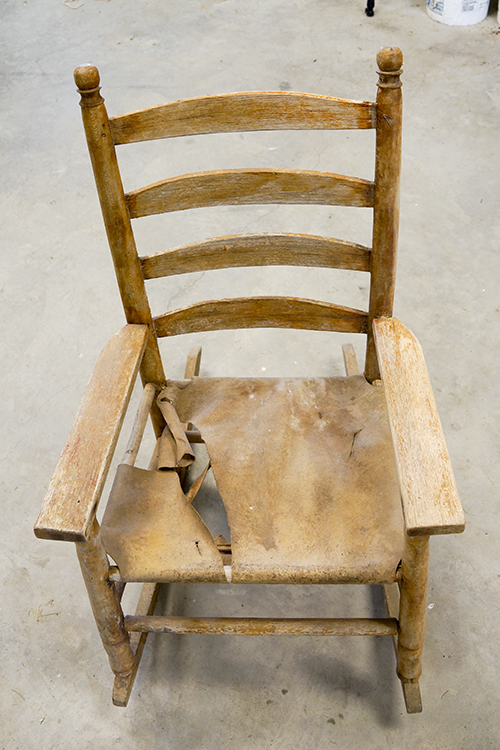 According to the family it had come from, the chair had originally belonged to a Confederate Army veteran from Osyka. After the original laced cane seat and back broke out, which happens with cane as it ages, someone had creatively repaired the chair with bailing twine and then padding and fabric. Clearly it was a comfortable chair, but they had no one to re-cane it. Now with the wood repaired and the original caning restored, it is an incredibly restful chair, that eases your mind as you sit and rock in it. This chair has seen it all from the Spanish American War to World War I, the Great Depression, World War II, the Korean and Vietnam Wars, the Millennium, the Middle East wars of today, and everything in between. It is a survivor chair and it continues to speak and remind us all that life keeps on rocking. Slow down and enjoy today.